We are releasing a few updates to the Search page on Monday April 27th. The search page will look very different, so we wanted to prepare you all for the changes. 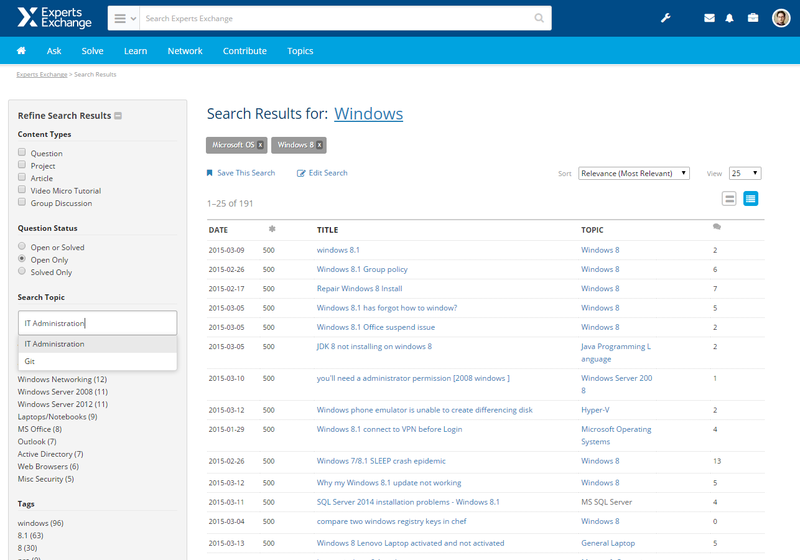 Our new search is live and I feel it works really well. It is very intuitive and the UX is much simpler. @coral47 My hope is that it doesn't take long to adapt to the new layout and user experience...I found it pretty useful and simple to use. Let us know if you have any additional feedback. We are continuing to work on more small updates with Search in the next few weeks. We should be able to release more improvements on May 11th! The UI wasn't really the main problem. Lousy result sets were. On Friday, I had to use that keyword string in Google to get the expected result, because the EE Search wouldn't turn it up. Today, the EE Search got it right, too. So ,THAT is a definite improvement! I am glad you feel search results are stronger. Our continued efforts with Search will further develop and refine the UX, while providing stronger result sets. For the community, please keep providing us feedback with ways we can improve Search for everyone. I am HIGHLY liking the new search page. Nice job guys..